Background: This discussion between Ela Bhatt and Katherine Marshall took place in Tokyo in May 2010, as Ela Bhatt celebrated her award of the prestigious Niwano Peace Prize. Ela Bhatt worked with colleagues to found the Self Employed Women’s Association, with the aim of documenting, validating, and monetizing women’s contributions to the workforce and the economy. She has long worked to effect change through political action. 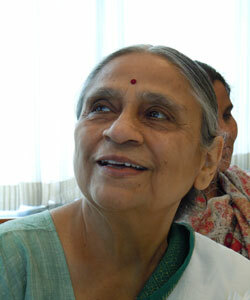 The discussion reflects on Ela Bhatt's career and explores how she sees issues of peace and justice, for India and beyond. The influence of Gandhi's thinking on her life work is a highlight, as is her relentless advocacy for the poor and for women. She underscores the importance of self-reliance, and of linking organizing and advocacy at the different levels, from local to global. Visibility, voice, and viability are key to changing the ethos of poverty; working through networks is what can unlock the potential for change. As a Hindu, religion has influenced her life and work by compelling her to work toward fixing the problems she sees that so deeply affect poverty stricken and marginalized women in India and more generally in conflict situations. You are receiving the Niwano Prize to celebrate your work for world peace. How does your work with women and SEWA tie to the broader quest for peace? Peace is not about a lack of activities of war. It is not just about general elections. Peace is substantive, lasting; it is about life. It is about the ordinariness of life, how we understand each other, share meals, and share courtyards. And that is what women do. That very ordinariness and the kinds of livelihoods that so many women pursue are absolutely central for life. That is what keeps communities together. And all these ordinary things are directly related to the health of nations. All bear directly on the high level dealings that go on at the national level, as well as day to day subsistence. This linking may often not be understood, but the community and its welfare have to come onto the agenda no matter what the issue. For economics, for example, it is not about surplus versus subsistence, rather the reverse. Nor is there a sharp contrast between the search for inner peace and a secure life. Inner peace is important, but I have always felt that living a daily life with peace is the end. So in reality individual peace and global peace are not separate. They are one and the same. And poverty and violence go hand in hand. Violence cannot bring peace. Poverty is violence. And it happens with the consent of the society. Poverty and violence are not God made, they are man made. Poverty and peace cannot coexist. And because women’s work is so central, if women were there, involved in decisions at every level, those links would be obvious. From social work to factories, agriculture, forestry, animal husbandry, dairies, hand looming, health care, childcare, handicrafts, providing shelter—all the employment sectors of any society—that is where women are. And when you talk of women and their work, you also talk about biomass and energy, and thus the economy and its true sustainability. Through women, what exists and is real, what is traditional, historical, modern and cultural, given the opportunity, is upgraded. That is what the challenge to bring peace is about. How did you come to do what you have done? What in your background inspired you? I grew up in the time around India’s independence, in the aura of a country fighting for its freedom. It was a heady and idealistic time, and we were all infected with a spirit of optimism, and the spirit of Gandhiji. I went to school and high school in Surat, in South Gujarat, then studied law in Ahmedabad. After a short time working for the government, I joined the large textile labor union TLA (Textile Labour Association); its creation in 1918 was inspired by Gandhiji’s leadership of the 1917 strike of textile workers. TLA was a pivotal organization through the whole period leading up to Independence and afterwards, at the heart of the debates about the meaning of trusteeship and the tensions around what role capitalism would play in independent India. The ideas behind TLA drew me, and they were and are important. TLA was very much inspired by Gandhiji’s concept of trusteeship, that professionals and capitalists and labor are trustees for the society hence ultimately all are responsible to the society. In that sense, the spirit of the movement is tied closely to the sense of responsibility that is part of the Gita, of Karma, and that gives meaning to work and to the independence of the worker. So these debates were alive during the early period of India’s independence. We were rebuilding the nation, looking to a more just society. It was a time when many of us were going to the villages to live there. We were a generation that had no confusion in our minds as to how to do things. Gandhiji had shown the way. This atmosphere infused politics and the way we did things. I married a classmate, also a student leader, and we were with our cohort in moving forward. We were all idealists. Were many women doing law at the time? Very few, maybe three or four, and almost none of them went into practice. I joined the textile labor union, and thus was working from the vantage point of the legal sector. The textile industry was huge in Ahmedabad, which was called the Manchester of India. There were more than 100 mills in the region, 80 in the city alone. I took up cases in the labor court, and was defending the interests of the unionized workers. The unionized workers were, at that time, among the best protected in India. There were specific relationships, remuneration was quite fair, they had social security, workers compensation, and so on. How did SEWA get started (for an excellent history, see http://www.sewa.org/About_Us_History.asp)? I became more and more aware, as I worked with the unionized labor, of the much larger labor force that was outside the purview of the protective labor laws, of any form of social security, access to justice, access to financial services, anything. That tugged at my heart. And those people were unorganized and had no strength to act to seek remedies. The injustice was flagrant and that was what hurt the most. That was why and how the working poor remained poor, how they had no recognition, no vote, no policies that took any responsibility for them, no budgets to provide support. They were the poorest among the poor. At that time, the informal sector, as it was and is called, represented about 89 percent of the total labor force (it is 94 percent now). Then, they were even recorded as non-workers in the Census; that changed in 1990, and now at least they are recorded as workers. When I was at the Planning Commission, in Delhi we were able to bring greater clarity to understanding the numbers and the trends. But there are still problems, as so much of women’s work is not recorded. Women predominate in the lower strata of employment. So, in 1972, we started SEWA, the Self Employed Women’s Association. SEWA in many respects is a microcosm of the general picture of the informal sector, in India and worldwide. SEWA’s members fall into the four general categories where women cluster. The first is home-based work—bidis—cigarette rollers, potters, weavers, producers, piece rate workers. Second are vendors and hawkers. Third are the providers of services: loaders, agricultural workers, construction workers, waste pickers. That includes the large category of domestic workers. And the fourth category is marginal farmers and producers. All have in common, low assets and the informality of their professions. SEWA is now the largest union in India, with a membership of around 1.2 million women. I stepped down as General Secretary in 1996, and since then have been doing many different things, leading the SEWA movement which is about economic freedom for the poor, women, and self employed. The Niwano Prize focuses on the links between spirituality and peace. How do you see those links in your own life and work? For me spirituality is about working with the poor, and working with the poor is spiritual. If you work with the poor, it has to be selfless. It is the reality we live every day. That is the essence of spirituality. As to my own background, I am Hindu, and my activism is very much framed within that context, of karma as meaning action. I am not the type who is particularly focused on the theology and stories, or thinking too much about things. If I see a problem, something has to be done about it. I am an organizer, ready to go in the street, and that has been so from the time I can remember. I believe that those who are weak have to get together, and that they have to find ways to come to the center, where decisions are made—the Ministry of Finance or Agriculture or whatsoever is the place of power. This is not just about a nice NGO; it is about bringing change. But that something has to be organized around solid values. Without that foundation, it is no use; there is no happiness. And in this, Gandhiji shows the way. What he has to say is so basic, so simple. People who hear it can say that they already know it, that it makes sense. You can generalize from that. There is nothing new; it is automatically, easily understood by me and you, poor, rich, rural, urban. The values are the very human values he talks about. Did you meet Gandhiji? Did he fire your idealism? I was too young, though I did see him once or twice. But he was all around the enterprise and the society. And my grandfather, who was a doctor, working as the Head of the civil hospital, was transformed by Gandhi’s call for action and joined the Salt March. He spent time in jail and as a result gave up his western life style. You say I am idealistic. But, I emphasize, we were all like that at that time, full of idealism. Not me. But perhaps. The country is moving in a different direction, times have changed. But for me Gandhiji’s values are still the frame, still alive and valid. How has SEWA dealt with conflict? Is it much involved in tensions? All the time! SEWA is about political action, and that has always been at the heart of what we have done. It is about changing the balance of power in favor of the poor. That has meant constant tension, with big farmers, moneylenders, contractors, big traders, government, local panchayats, and so on. Injustice happens at many levels, from the grass roots to the top. And one of the keys of SEWA’s vision and action is linking them. How does SEWA work to achieve what you describe as the key: linking action at the different levels? At the grass roots, it is not hard to see who is the exploiter and how it is happening. The roles of the moneylenders and the police are obvious. It is not hard to identify the labor commissioner or the government official who is responsible. But soon there are obstacles. When we wanted to fight those who were exploiting, to fight the system, we ran into problems. When a poor person tried to go to a lawyer, no one would take the case. There was a time when we were organizing the street vendors, and the lawyers refused to touch the matter, because they themselves saw the vendors as a nuisance. But still, all this was understandable and within reach of most people. At the national level, however, it was more difficult. We have good labor laws and social laws but are weak in enforcement. Plus the corruption at various levels, including the global. So we need to organize at various levels. To do that we need to have networks, to make allies. That means the universities, for example, those who build concepts and can help in communicating them. It is a continuous process. You organize and build. But then you also need institutions. It is all very well to organize, but then you need to follow through, to serve. That means that you have to have institutions that will serve the needs of the working poor, institutions that go deeper and meet their needs. That means schools, for example, there should be agricultural schools on every block in India, where agriculture is so essential. And modern knowledge, ICT: why should it not be possible to bring modern knowledge closer to the producers and the rural markets? Globalization is happening all around—I am not for it or against it, and see it as nothing new. But it needs to work for the poor, not just the rich. So I am pro-poor, asking how the working poor can get access to the benefits of modern knowledge and tools. And that means they need institutions, where they are, institutions that serve them. The only example of such institutions truly working well are the microfinance institutions that are now in place. There are working on the principle of self help, reaching into the villages, and they have cut into the moneylenders’ grip. They play the role of the informal finance sector, and serve businesses in need. That kind of institution is needed in all sectors. And systems are needed, for example for management, accounting, skill development and MIS to serve the needs of the working poor. Why do we not have that? Because it has never been the priority of our government or of any institution for that matter. And partners—there is a need for real partnerships, partnerships as equals, that share the risks. Poor people like those who are SEWA members, can organize to build up cooperatives and to make their small enterprises, which are simple more viable. They can build them up to a certain scale with support and microfinance. But then they need partnerships and support to go further. They need hand holding, someone to show how to work better, some technical assistance. That is the challenge now, how to find those kind of partnerships. You need institutions and partners who are prepared to put in investment, waiting for longer time periods to see profits. So those are the key elements: linking different levels, organizing, building skills, developing institutions that serve the poor, bringing the resources of modern knowledge to bear, focusing on systems, and finding the kinds of partners and partnerships that can allow members to move forward. Microfinance has played such positive roles. Where do you see it going? Microfinance is the best example of success in the kinds of systemic institutional areas I have highlighted. But it is facing important challenges now, challenges that raise some broader questions. What is success, what is the meaning of success? Is it success to have 100 percent repayment, that poor people have become viable? That empowerment has increased, that they have ownership and assets? These are not easy questions. And, ironically, the reputation of microfinance in facing some dangers as the sector grapples with these questions about the meaning of success. What do you mean here by empowerment? What we really are looking for is self reliance and that is how we should measure success. I don’t much like the word empowerment, but self-reliance is the foundation of SEWA’s approach, because without self-reliance there is no power. A key to that is decentralization of decision making and of resources. Poverty as a phenomenon is something elusive, something that comes and goes. Someone who is poor one day is not poor the next, then in no time they become poor again. SEWA’s members have sufficient to eat. They are not starved any more. They have escaped to a large extent from the clutches of the moneylenders, the contractors, the middle men. And in the process, a woman’s own self esteem has grown. She knows “I can manage”, she knows that she is important, she knows her identity, that “I am a worker”. She has a name, an address, a bank account number, an insurance policy, a pension plan. She has learned who the exploiting forces are. She is more aware that poverty is not destiny: that she does not have to accept that as her destiny. You see that transformation all the time. The macro forces change, but what the women have gained is self esteem, a sense of mutuality that is strength giving. So it is not giving power, because it is a process, an ongoing process that is not something to give or take back. Happiness is when you do something on your own, when you do things and you understand why and how. Women form a cooperative, they go to the panchayat head, and appear in court. These are the things that educate them. And no one can rob them of it. But what makes me happiest is that they see that they are more self-reliant, and they are fiercely independent. This is very much the Gandhian approach. How have interreligious tensions affected SEWA? SEWA has about one third Muslim members and one third Dalit, and most of the rest are other under-privileged groups. Because we serve minorities we are thus very well aware of how the social and religious tensions affect the poorest communities and people. When there are riots among the dalits, they affect our members. We work on rehabilitation, and on education. We represent the minorities against attacks that come from many directions, but especially the higher caste Hindus. But the tensions in many respects have made our organization stronger. There is more mutual helping, and greater assimilation among our members as a result. Kamla Chowdhry in the final years of her life spoke constantly of the very practical problems of sanitation and the devastating impact of lack of facilities on women. As an illustration of SEWA’s approach and interventions, could you highlight how SEWA might be involved in an issue like that? Sanitation is a terrible problem for women, and, though some progress is being made, it is still devastating. SEWA is involved indirectly, not directly. SEWA is urging changes at the policy level. Every year we make proposals at the time of decisions on the government budget, that action be taken, at least in the cities, that all families should have at least a toilet. We did it this year again, and again it was not taken up. But the policy is slowly changing. The blockage is linked to land ownership in the cities. The objection has been that the government could not support or oblige standards where land tenure is uncertain, but that barrier is coming down. SEWA Cooperative Bank also supports change though its loans. They are building not so much toilets as upgrading housing, to include water lines and sewer connections and the installation of the facilities. SEWA is involved in training, upgrading the skills of members. After the Gujarat earthquake, all work stopped, then very slowly revived, so workers had time. SEWA took advantage of that to do skill upgrading, and more than 5,000 women were trained, in that case many as masons, at the Open Air University. They took the examinations and many passed so they are certified as masons. But that is not enough, because what employers want is multi skilled labor, people who know wiring, plumbing, plastering, bar bending, tiling, carpentry, and so forth. The training is leading into slum upgradation and some are taking loans. The people who live in parts of Ahmedabad are building pucca walls, not of earth but of brick, and making verandas so they can sit, and a place for their daughters. And what I like the most about this is how the local capacity of the people and the economy grows. The women and people gain the capacity to solve the problems of the community. In taking action they solve the problems, one by one: the building requirements, legal issues, licenses, accounting, what the requirements are of bribes, how to avoid them or even, if essential, how to pay them. Do you see attitudes towards SEWA’s work and approach changing? There is good will. People want to do something better, to see life improving. But the middle classes also face the dilemma that they want to remain safe, to be sure that their children are secure and have opportunities. So they are ready to do good work. But there is not a deep sense of justice at work. It is similar to the trend towards corporate social responsibility, or CSR. The increase in CSR worldwide reflects both the response to pressures on companies from outside but also their wish to use their money well and to do good but it usually lacks a sense of the underlying justice issues. There are good things happening. My son did an evaluation of work done after the tsunami and was impressed by the good use that people, working together, had made of the money. The local people were able to build themselves, and to make decisions about how to do it. The fishermen chose their own boats. And the result was that they built their capacities in the process, learned skills. The key was trust. Every human being has something, a spiritual element, that makes them want to do better, to reach higher. How does SEWA approach its primary focus on women? When SEWA works with women, it insists that the ownership of assets will be in the name of the woman when debts are repaid and a mortgage is released. Sometimes the husband objects; some have come to me and said that they could not accept that property would be in the name of their wife when he is alive. But I answer that SEWA knows the woman, has a history, knows her savings pattern, and trusts her, so we gave the loan to her. And what happens is that the mortgaged land goes back to the family, and we know that it will not be mortgaged again, because the woman knows that if she is in need she can get a loan from SEWA. And some men have also come afterwards and said that they were glad, because indeed they would have mortgaged the property again had they had the power to do so. The woman sees the asset as belonging to the family and she will not lose the asset. Assets are safer in the hands of women. You mention networks several times. How do you see them working and which are most successful? WIEGO (Women in Informal Employment: Globalizing and Organizing, http://wiego.org/) is a wonderful example. It has helped us to bring international relationships to members at all levels, so that we can share the benefits in many ways. Streetnet International, based now in Durban, works in 41 countries. And a Homework network has emerged, and is working quite well in Asia and South Asia. It has launched a brand, Sabah. The waste pickers and domestic workers are building their networks now. All my life I have worked to change concepts, and that begins with how people see and understand the problems. The biggest obstacles, obstruction, and opposition come from blockages among the policy makers and the educated. That is why we need to organize at different levels, across borders of all kinds, building on relationships and on people, from the grass roots to the international, from cooperatives to Cornell University. Because we need the knowledge as well. To end with one story about WIEGO. We were working at the ILO in 1995-96 for the Convention on Home Work. We had the votes for passage, but the system at ILO is that a convention must pass in two successive years, and the vote was very close. The objection was that we simply did not know the numbers of homeworkers : who were they, where, how many, what were they doing? We (WIEGO) knew but our knowledge would not be accepted because we were advocates. Our (mutual) friend and ally, Martha Chen from Harvard University happened to be in Geneva at that moment, and I was sharing the problem with her. Immediately she mobilized, and within a few months there were excellent numbers, Harvard University blessed and stamped. No one could object any longer and the Convention passed. So the keys are visibility, voice, and viability. And networks are a key to all three. “As for the present owners of wealth, they will have to make their choice between class war and voluntarily converting themselves into trustees of their wealth. They will be allowed to retain the stewardship of their possessions and to use their talent, to increase the wealth, not for their own sakes, but for the sake of the nation and, therefore, without exploitation."